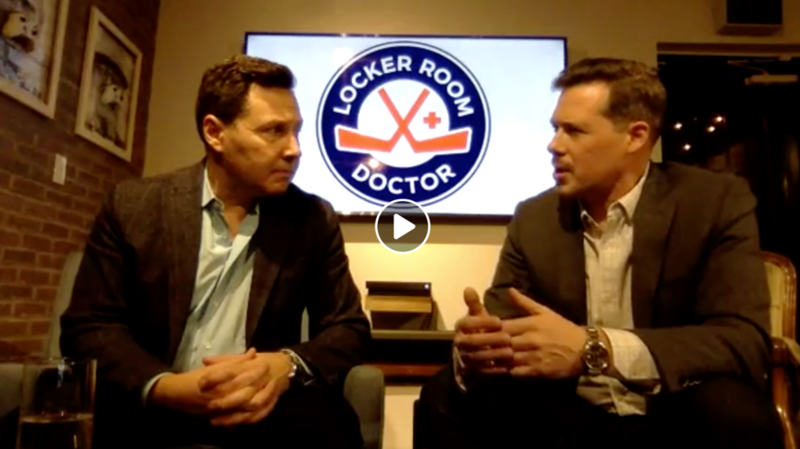 The following is an interview taken from a Facebook Live event hosted at Movember Canada with Dr. Tom Ungar, head of Psychiatry at St. Michael’s Hospital, and Mike Heinrich, Managing Director at Reframe Health Lab. Watch the full Facebook Live video right here. [Mike Heinrich] What is good mental health? Everybody feels anxiety or depression sometimes, but where is the dividing line when it comes to a mental health issue? If they build up and become a problem that make you suffer and really interfere with how you function – then we start to talk about if there is something going on. Maybe there’s a condition you need help with. These names can be confusing, but if you’re sad, anxious, down or depressed on occasion – it’s totally normal. Interfering with function sounds like one of those keys like they can’t get out of bed or you’re not able to do the normal things you enjoy that are part of your everyday life. We all have a day here and there, but when it starts blocking what we do for a couple of weeks and continues to grow, and you’re just not yourself, or you can’t function in your relationships, at work, school, your family – that’s when we start to get concerned that there’s something else going on. You mentioned the language,that these common experiences have these names, can you talk about destigmatizing them? Are most of these things classified as mental health disorders? And is that a scary term? It doesn’t make a difference to me as a physician, because they’re just conditions. It’s not your fault. It doesn’t mean you’re not smart or you’re not trying hard enough. It’s nothing about you, it just happens to be the condition you’re experiencing and we want to figure it out so we can make it better, so I don’t attribute it to you. These labels and names; we just call them this so we can try to understand them and study them to figure out the solutions just like any other health conditions. There are names like Clinical Depression and Clinical Depressive Disorder – but don’t get too hung up on them. The idea is if you have a health condition, get help to get better. In our most recent video, How to Talk to a Friend About Suicide, you are the doctor on the bench calling the guys knuckleheads and explaining why they don’t have to be afraid of talking about it – and that’s really one of the key points here is that talking about these things is a good thing. The language we use around suicide changed in recent years, we’re not using terms like “commit suicide,” or “suicide attempts” anymore – what’s the difference in the language we use around those things? That is really a great development because we started to understand that if you die by suicide it’s like dying by cancer or heart disease – it’s an outcome of the condition you’re suffering from. You did nothing wrong. Committed is a word used when there’s a crime. We had to get away from this because you’re not bad, it’s nothing about you, it’s just a health condition you’re suffering from. Some really great people in the media including some health reporters, the World Health Organization guidelines, and in Canadian guidelines – you start to see them say, “he died by suicide” or “his life was shortened by suicide.” It’s a much nicer way to say it, because people still have these wrong associations with suicide and just don’t understand if you have a symptom of a behavioural outcome of what you’re going through. And for mental health, socializing and activity is actually good for your mental health, right? Yes. It’s funny because I was annoyed the other day when I was playing hockey with a bunch of amazing young hockey players, and I was just chasing them all around the ice. I was complaining on the way home to guys my age about it, but I was out and socializing and getting great exercise – and that’s the reason I do it. We’re talking about mental health tonight and primarily suicide, and the key takeaways from this are that you can talk to people about this. And as a friend, you’re not going to give someone the idea of suicide – in fact it might be something they want to get off their chest and might even be relieved. It’s usually a huge relief! And it actually lowers the chances that they’re going to do something or have continuing thoughts about suicide because they’ve actually talked to somebody about this. I know you’re worried you’re going to give them the idea – but you’re not. It’s a tremendous thing you can do for them, if you’re concerned – just ask them. Are there signs that it’s getting beyond someone feeling depressed for awhile to the point of serious concern? Yes, so it’s opening up the conversation and showing that you care. Exactly. However you want to do it – just ask. It’s the best thing to do. Asking is one of the key points there. And Movember has a great method called ALEC to help you remember. It’s a process to keep things in mind: Ask, Listen, Encourage to get help and then Check in afterwards. So, the listening part, you don’t have to have the answers? Nope, just listen with no judgement. You’re not an expert, you’re not supposed to know what to do. Just listen to them and be there. And encourage them to get checked out. That’s really it. We don’t expect anyone to know what to do, that’s not your job – that’s my job. Just encourage them to get some help. That could be talking to a family doctor, talking to a mental health professional, and the nice thing about the digital world these days is that there’s a lot of different resources in place and you can start by Googling it. It’s amazing what’s online now. There’s phone numbers, crisis and suicide hotlines, and now texting lines; so it’s amazing the number of ways you can encourage them to get help. They can do it privately on their own, but just doing it is a big step. And texting is a great option for younger people. And of course, with Locker Room Doctor we deal with middle aged men who probably can’t text well, so it’s all about what works for you. Whatever that person is most comfortable with, there’s always a route for them. And then checking in, you don’t want to be bombarding them every time you see them, so how does that work in a practical way? I’ll listen to what they say, but just having someone listen to them is really helpful. Don’t go at them, and you don’t want to challenge them. There’s no problem. Just be there for them. Let them know you’re concerned about them and just leave it, but keep checking in with them, and maybe at one point they’ll be ready. They might go home and think about it. You’re not going to break through that and try and fight it, you’re just there to express your concern and let them know you’re there for them if needed. What kind of resources could we direct a friend to if they don’t know where to start? If they’re in that state of mind, they might feel overwhelmed and they might not want to Google it like there is no hope. Where can they start with resources? I get calls like this all the time, even from other physicians looking for help with family members. You can call crisis lines because they will direct you to resources. I always like starting with your family doctor, because everyone has one and they’re like your quarterback to direct you to various services. But if you can’t make that appointment and you can’t wait because it’s more urgent, the emergency room is open 24 hours a day. People like me will always be there and that’s what we’re there for. Just like when we see accidents and car crashes, we see mental health concerns from people coming in. And that’s what we want to be doing – that’s what we’re there for. And that’s a great distinction as well for somebody that is in a crisis situation. The online resources are there for people who know they want to get help because they know they’re having these scary thoughts and want help to get off this direction they’re going. When people are down and depressed with suicidal thoughts, they think there’s no hope so they don’t bother because the condition zaps your energy and you retreat back into yourself, and the last thing you want to do is to reach out for help. And that’s where they really need help. If you can just encourage them to take that really tough step when they don’t feel like doing that. There’s no wrong way to access help – as long as you go and get it. Primarily with Locker Room Doctor, we’re talking to guys like ourselves, middle aged men, what is it about guys that have a higher propensity for suicide? Between 40-60, there’s a huge increase in suicide, that’s common. Every health condition kicks in at a certain time in your life with certain risks, we don’t know exactly why, that’s just what the numbers show. It might just be that things aren’t working out the way you had hoped for in life. It can be a time of divorce, a time where you might lose jobs, so it’s a complicated time of life to reflect. It just seems to be that age range where these conditions kick in. There’s also a time period of late teenage years to early adulthood where that kicks in as well. Another online question here. Should I feel worried about being labelled after I open up about how I feel? Oh gosh, I hope not! But it might happen a little bit, and that honestly happens. I do a lot of work on stigma reduction, trying to get people to understand it’s just a health condition. There’s some biological things, but not everybody understands it, so the odd person might bungle it and say something foolish – try not to focus on that. Most people understand it. 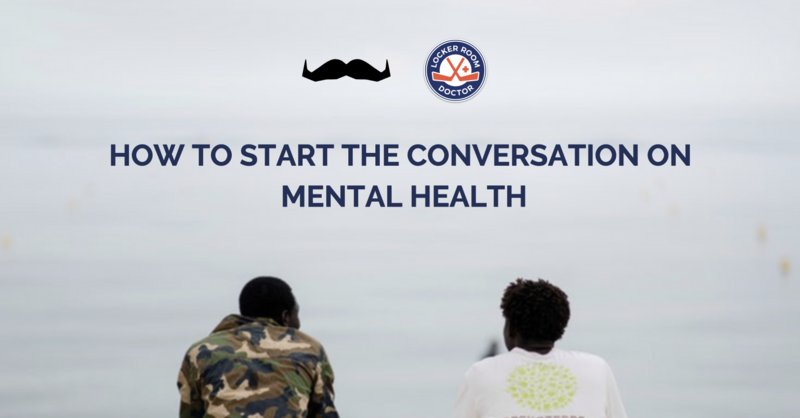 Initiatives like Movember and the Locker Room Doctor are really changing the conversation. We’re now seeing all kinds of celebrities and athletes trying to normalize it. So things are changing, but we’ve still got a ways to go – but don’t label yourself. One of the things is self-stigma, so when you don’t understand that it’s not you personally. Please don’t think it’s you. It’s just a health condition that can get better. Please reach out. We’re hearing from a lot of NHL players nowadays that they’re “sick, not weak” and that it’s just a medical condition. And that’s a great way to frame it. It’s a health condition. We used to moralize it like you’re a bad person, but it was because we just didn’t understand it – it has nothing to do with being bad or weak. It’s a condition that I want you to treat and to get better. And it’s hard because people can’t see it. People can’t see how your brain is functioning. We’re starting to do that when you can see [those images]. We can’t do it for clinical treatment, but we’re doing it on the research side, because seeing is believing. It’s coming and it will be exciting. And if you’re interested to learn more, you can Google it to find out about that stuff. With NHL players coming out and talking about mental health and potentially that’s connected to the blows to the head and things like that – is there a connection? I don’t know if it is for all of them, but there is some association with the head injuries and the traumatic brain injuries leading to depression. And untreated depression for having suicidal thoughts leading to further risks. So, there is a link between head injuries, depression and potential suicide – but they don’t all have that link. The majority has nothing to do with traumatic brain injury, but it is a piece of it, but we tend to wrap it all around the big exciting headlines we see in the news. Again, just to recap, if you’re concerned about a friend or somebody you care about, you can remember the term ALEC (Ask, Listen, Encourage, Check-In) and you can find it on Movember’s website as well. And guys love to solve problems and do things – so encourage them to get help and encourage them to solve a problem. I think that’s a great way to see it. And it’s not that we can solve the problem, it’s that we can encourage them to talk to a professional. Thanks to everyone for tuning in and sending in questions. A big thanks to Movember for hosting us and supporting these initiatives, and to Dr. Ungar. Have a look at our video. And most importantly – talk to each other. There is help out there and it starts by talking to your friends.